Reading and share top 7 famous quotes and sayings about Spiritual Nourishment by famous authors and people. Browse top 7 famous quotes and sayings about Spiritual Nourishment by most favorite authors. 1. "I would like to coin the phrase alimentary theology, a theology that is more attentive to and welcoming of the multiple layers contained and implied in the making of theology. This is a theology that not only pays closer attention to matters related to food and nourishment, and the many ways they can relate, inspire, and inform theological reflection. Most importantly, it is an envisioning of theology as nourishment: food as theology and theology as food. Alimentary theology is envisioned as food for thought; it addresses some of the spiritual and physical hungers of the world, and seeks ways of bringing about nourishment." 2. "She had left his church and gone to the missionars, and there found more spiritual nourishment than Mr Cowie's sermons could supply, but she could not forget his kisses, or his gentle words, or his shilling, for by their means, although she did not know it, Mr Cowie's self had given her a more confiding notion of God, a better feeling of his tenderness, than she could have had from all Mr Turnbull's sermons together. What equal gift could a man give? Was it not worth bookfuls of sound doctrine?" 3. 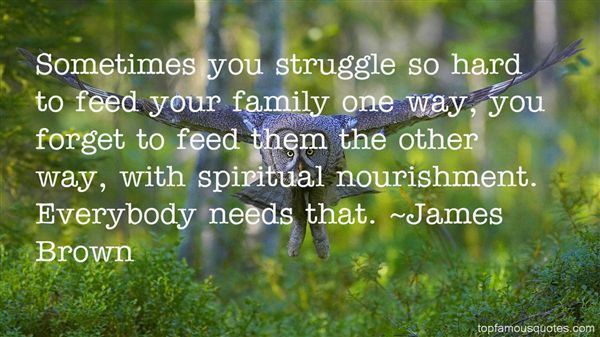 "Sometimes you struggle so hard to feed your family one way, you forget to feed them the other way, with spiritual nourishment. Everybody needs that." 4. "Where will Christian feminists go for spiritual nourishment if the church itself fails to reflect the feminism of Jesus? If tradition becomes a reason for churches, for synagogues, for mosques to refuse to change in the light of new insights and understandings, on what grounds can we expect change from other institutions?" 5. "Now, we shall be able to judge the extent of the spiritual undernourishment if we look at all these movements from another angle: not as errors but rather as attempts to find healing. I use this comparison: For a long time medical men combated fever as if it itself constituted the illness. Medicine today inclines rather to respect it, not only as a symptom of the disease but of the struggle of the organism against the disease. 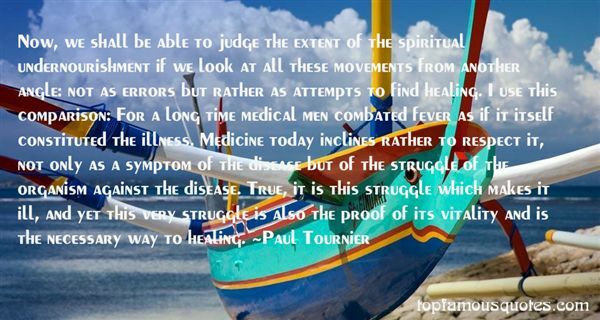 True, it is this struggle which makes it ill, and yet this very struggle is also the proof of its vitality and is the necessary way to healing." 6. "It's so funny being a Christian musician. It always scares me when people think so highly of Christian music, Contemporary Christian music especially. Because I kinda go, I know a lot of us, and we don't know jack about anything. Not that I don't want you to buy our records and come to our concerts. I sure do. But you should come for entertainment. If you really want spiritual nourishment, you should go to church...you should read the Scriptures." 7. "Be consistent in your dedication to showing your gratitude to others. 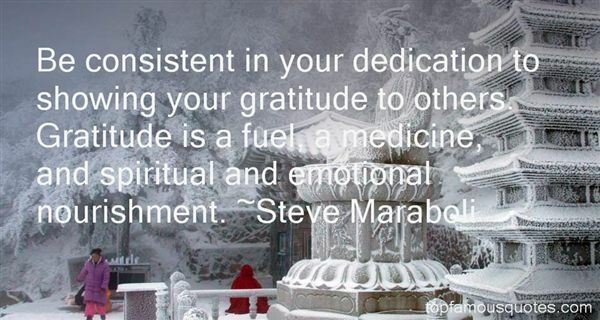 Gratitude is a fuel, a medicine, and spiritual and emotional nourishment." There are things coming from me that I felt I wanted to talk about. My search for my own blend of spirituality, my acknowledgement of my sexuality, my being the single mother of a young man."